My 85-year-old father-in-law, Jack, loves to share stories. I was driving him home after a family dinner. Living in Winnipeg in February is not quite like living at the top of Everest but the temperature has been below 40 degrees for more than a few days. One bonus of having so much snow and cold is that you can build a snow fort. The children on my street built a fort on the island at the end of our street. See the picture with this article. As we drove by it my father-in-law shared a story about building a snow cave when his oldest daughter, Judy, was just a young girl. The story is a powerful example of trust and faith. 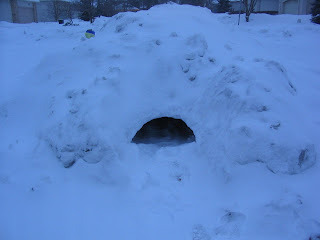 They had been building the snow cave for quite a while when suddenly the fort caved in and Judy was buried underneath all the snow. Jack looked for her and realized he did not know where she was under all the snow. He tried one spot, did not find her, and frantically moved to a new spot. After what seemed like an eternity, he finally found her buried in the snow. You could see this as the naive faith of a small child but I see it as the power of trust and faith. As leaders, do the people we lead know that we will come to their aid when they are buried in too many task to complete, too much stress, or suffocating under an avalanche of demands. 1. Who has faith in you as a leader and knows that you will rescue them when they need help? 2. How frantically will you work to help others who are having difficulties? 3. Who will pull you out of collapsing cubicle cave? 4. Look around your workplace and pay attention to those people who may be in danger and make it safe.